Georgina Campbell published the following review on the Georgina Campbell Ireland Guide website September 19th, 2018. 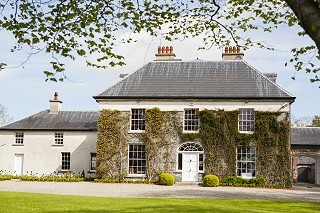 “Just South of Gorey, near Ballygarrett in North County Wexford, this unusual Georgian gem offers luxurious country house accommodation - and fine dining with a distinctly French flavour. Not suitable for children. Rooms 4. B&B €160-€180 (room rate based on two sharing); single occupancy €125-€145. Dinner from €50 (book the day before); open to non-residents by reservation (Fri & Sat). Wines from €29 (glass, €7.50). Master Card, Visa. Open all year. Former restaurateurs Philippe and Brona Brillant bought the property in 2014, did a massive restoration job on it and opened as a quietly relaxing destination for adult guests the following year.Having lived in the UK for 25 years, it’s been a kind of homecoming for Brona - who is Irish, and her great-grandfather was born in Ballygarrett - and her husband Philippe is a classically trained chef with many years experience in top restaurants. Most recently, they had a restaurant in Henley on Thames, and it’s clear that their professionalism has stood them in good stead in this new venture. Breakfast includes ‘all the usual offerings’ and follows the same pattern of excellence with freshly baked croissants and other viennoiserie offered along with a lovely sideboard display of fresh fruits and cold foods.